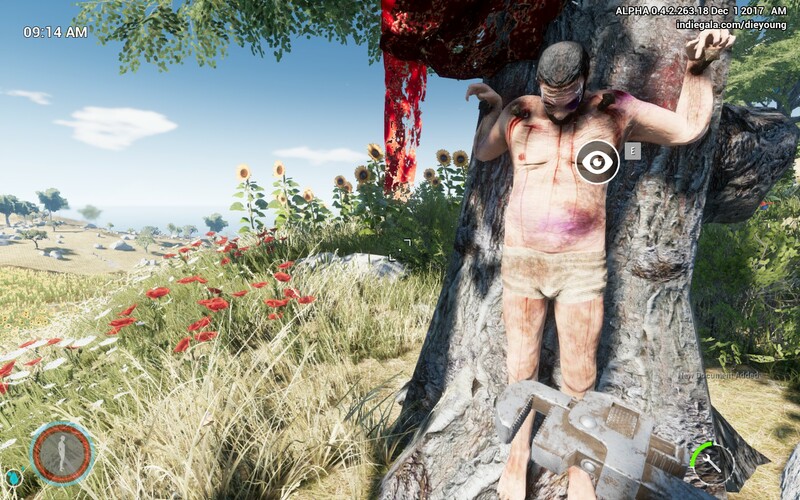 The following game is added to the long list of open-world survival games that has been finding its way to the vast majority of players who embrace this era with pleasure. Games such as The Forest, The Long Dark or Rust are paving the way for what seems to be a journey searching for the ultimate sandboxing survival game. Die Young, currently in Early Access for as little as $14,99 on Steam, seems to be an addition to this pavement. The game kicks off with a bit of story, telling us about some wealthy up-state people who are living on the edge just to get the best rush out of life. At a certain summer, you and some friends have been partying at a beach, which was supposed to be a fun holiday like always, however, even though you don’t remember what happened exactly you know you were buried alive. This is when the game starts. You wake up in a well where the climbing mechanics are introduced because you need to climb out of it. Once out, there is nothing but a dangerous overly heated landscape around you. Any other time it could have been a lovely day in France, but this is not one of those days. Dogs, psychos, and nature are all out to get you and on top of that, you are going to try and find out what the hell happened. Now, graphically, the game seems a piece of paradise. 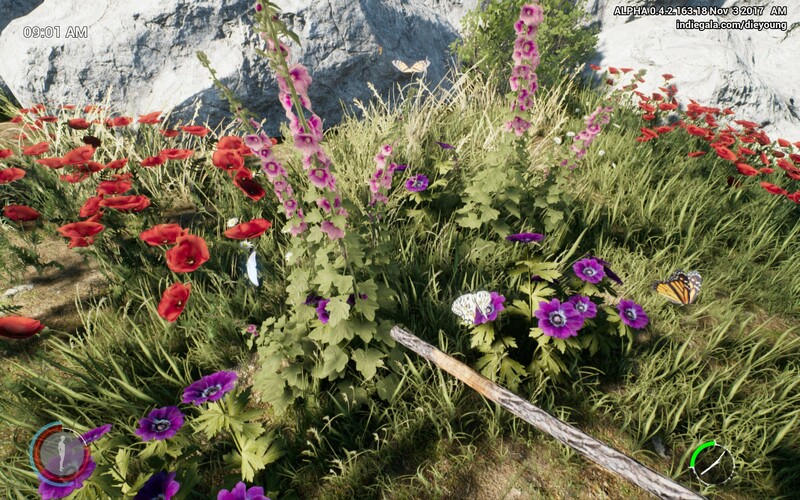 No, literally, the elements used such as the rich flora with all the butterflies really make the environment look nice. And still, you will feel uneasy walking around. Which is good, cause the survival/horror elements slightly shine through all the time you play. Your body looks roughed up and dirty, and there is no real safe place for you to stay. This means you have to keep moving like a freerunner, trying to avoid all the bad mojo around you since fighting is not your strongest side. Luckily you seem to have the body for it, unlike people in general who write video game reviews. Whenever you do have to fight, it’s more something you do to repel attackers with your wooden stick or iron wrench. Trying to win an entire fight might be possible against one enemy, but versus two or more you are definitely screwed. This entire concept of ”better at running than fighting” is also noticeable in your Heads Up Display. Even though you are healthy, your health in a fight will drop pretty fast. Your stamina and fluids, however, stay good for a pretty amount of time. The gods granted you a pair of sprinter’s legs. Use them wisely. It’s one of the things that make the game interesting. 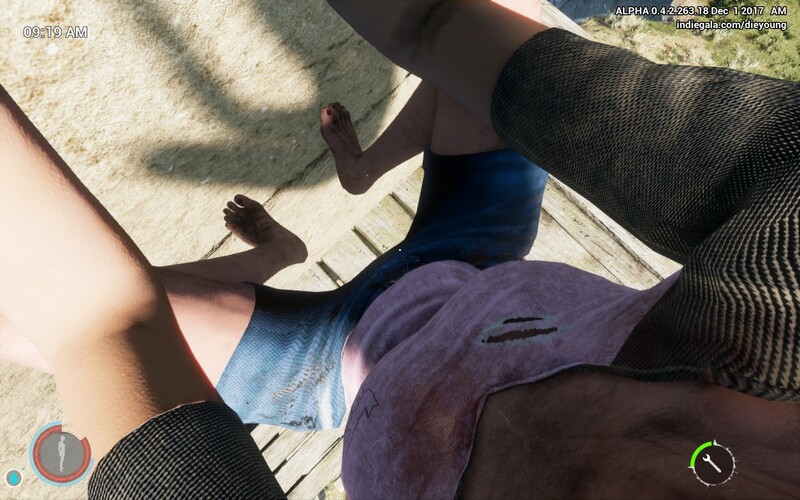 Where in other open-world survival games you are allowed to build bases and weapons to become gradually more powerful, Die Young puts more focus on staying alive with realism. Stay hydrated, use your time well, build fires, fix water pumps. Making mistakes means death. Don’t die. The other part of what makes the game interesting is the story and how it tries to be included in the entire gameplay. It will quickly become apparent you are not the only victim of the gruesome world around you that slaughters its victims in this heavenly piece of landscape. You try to find your friends, the reason why you are here, and an escape plan. The outlook sometimes looks very grim as you start to discover more. Even though it’s amazing how the game succeeds in making a beautiful environment a horrid experience and a running sensation, the game has a few possible flaws. Possibly, because they are subject to personal opinion. For one, the sound design. The music switches between easy-going guitar and rock ‘n roll in scenarios where you are being chased. Including the effective, but slightly out of place Metal Gear Solid-like famous ”an enemy has spotted you” sound, it seems like more could be done with this. The voice acting is a bit low-quality, but with some editing and mixing it could become better, enhancing the experience of Die Young. Another point is the platforming while running. You relatively need a lot of space to start running before you make a proper jump, while the hints in the environment like white paint telling you to ”jump here” seem to contradict this, ensuring you will fail. Other than that, the running works well. Die Young is a very promising game, and especially for its low price, it could already be worth your buy, even in early access, a feat which is scarcely performed. It’s evident that there’s been a lot of work done on the modeling, animating and environmental elements, and it pays off. The tension, partial high realistic gameplay, and story should be enough for players to already enjoy themselves a lot. Even though there is still some work to be done, the game will surely be a valuable addition to your collection sooner or later.